This is the website for a new Golden Heroes PBeM Campaign, set in WWII. It began November 2012. The focus is on a reinvented Scarlet Pimpernel. 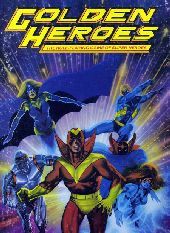 Golden Heroes is a Superhero Role Playing game published in 1984 by Games Workshop. It didn't do particularly well and rapidly fell out of print. That's a pity, since I think it captures the feel of comic books, particulary the late 70's early 80's style of team book, better than any other game out there. I like to say that Champions is a better superhero game, but GH is a better comic book game. Your mileage, of course, may vary. GH also has a couple of features that make it better suited to a PBeM forum than most other supers games. The combat is relatively straight- forward, much simpler than Champions, for instance. Advancement is based on expending one's free time (Day Utility Phases or DUP's) on various activities, providing something to do in the "down time" between adventures. Characters diverge wildly in power, but are all vastly superior to normal humans, which allows for some nice effects. I could ramble on, but the upshot is this: for email gaming, I think it's the best choice of the various supers games I am familiar with, and I'm familiar with quite a few.